In Australia most states will allow the removal of up to 10 squares of asbestos containing material without a licence. In this guide, we will explore the steps for DIY asbestos removal and recommended safety precautions you should take. Remember asbestos is very dangerous once it is airborne so you should always take extreme care when handling asbestos materials. In a recent interview with Jack Newman from Pro Asbestos Removal Sydney , he said “while it is legal to remove small amounts of asbestos yourself, it’s still very dangerous if you don’t take all the required safety procedures. Make sure you purchase all the safety gear and equipment before you start any asbestos removal project”. This term refers to certain naturally occurring minerals that there are six types of which are known. The big issue with asbestos is that it is made up of fibers which are resistant to heat and many chemicals that you may subject it to. Also, it has been known to cause cancer, in people who have been subjected to it. Known as mesothelioma where it affects the lungs particularly the lining. In this guide to DIY asbestos removal, you will find what you need for your protection. Asbestos is usually odorless and has not taste which means that you can ingest it unknowingly, which is what makes it imperative that you locate and completely destroy it. Lung cancer and asbestosis are just two of the things that you risk getting when you have been exposed to this miracle mineral. There are many places that you can find asbestos as it has been used to make so many appliances that you will find in the house. You will also need to make sure that you know where to look for asbestos deposits so that you can get all of it when you are cleaning. Here are some of the spots that you will need to look at. The thing about the asbestos that is released here is that it will disintegrate and form a dust that when inhaled over time will cause you to develop lung cancer and other health problems that come with having it in your system. The asbestos is also found in old plumbing pipes and the fibers that it is made up of can be swept up into drinking water that you have in your home. The vets and fans also contribute to the spread greatly. The asbestos regulation in Australia is governed in all states by the statutes and codes of practice that are set up by the government. These rules and regulations are found on the Australian Government’s Asbestos Safety website. The work, health and safety legislation -This one regulates and manages the control and removal of the asbestos that is found in the workplace which is also inclusive of all residences that are workplace when there is a contract that allows a contractor to work in removing the asbestos. Public health legislation – this one is applied to the asbestos related activities that will or may be carried in and or around non-workplace settings. 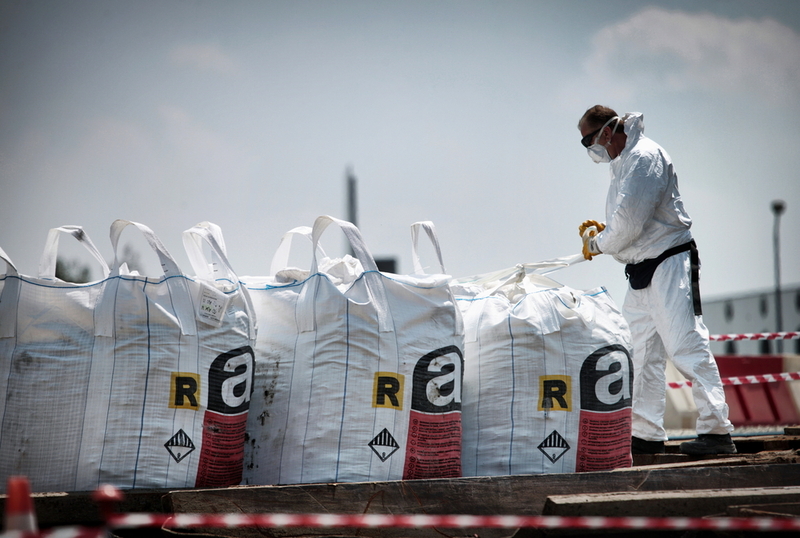 We have included the major steps in this guide to DIY asbestos removal to help do this right. You will need to follow all of them to make sure that you do not miss anything. Safety gear is very important seeing as you will be dealing with potential dust made of asbestos and exposure to fibers that are small and easily penetrate your skin and enter exposed orifices like your eyes and mouth and also wounds. Isolation material for the area to clean. Wet cleaning – this means that you mope the area that you think has asbestos and discard the rags after use. While on rooftops, consider other methods as this may cause slipperiness. pick up very tiny particles including the dangerous asbestos. specially made steam machines will help get all the asbestos out. When you have finished cleaning, you will need to wrap asbestos material and prepare it so its ready to be picked up and dropped off to an approved Government waste facility. For pick up and disposal contact a licensed asbestos removalist in your area. Asbestos disposal facilities will be found where you can drop them off. As you have seen in this guide to DIY asbestos removal, this is a hazardous substance that needs to be avoided. This entry was posted in Asbestos on July 13, 2017 by admin. Asbestos is categorised as a hazardous substance. As a result, people who work with asbestos must have sufficient training on how to safely handle as well as transport the material. It is a prerequisite in Australia to have a licence in order to handle or remove any material that has asbestos. It therefore means that a licence holder and the workforce covered by the licence are the only one permitted to work with asbestos. The licence permits the removal of all forms of asbestos including the friable and non – friable asbestos. The licence allows the removal of asbestos in amounts that exceed 10 square meters of non-friable or bounded asbestos. However, it is possible to remove asbestos in amounts that do not exceed 10 square meters without necessarily having a licence. Such removal of asbestos without a licence is governed by 10sq m rule. Besides, asbestos removed under this condition should be in bounded or non-friable form. Every state and territory in Australia has different regulations governing the safe removal of asbestos containing material. The regulations that govern the removal of asbestos in each state are featured below. The licence permits the holder to remove all forms of asbestos including friable and non-friable asbestos. The licence holder can remove more than 10 square meters of bonded asbestos containing material. Besides, an individual can remove asbestos without a licence in an area that does not exceed 10 square meters in New South Wale. However, you need to have sufficient training on how to handle asbestos containing material. All the information and application procedure of asbestos licencing within this state can be obtained from Safework NSW. Insulating material primarily for maintenance work in an area not more than 0.5 meter square. Non-friable asbestos in an area that do not exceed 10 meter square. However you will need limited licence in order to remove non-friable asbestos and unlimited licence to carry out the removal of all forms of asbestos containing material. A person needs to remove less than 100 meter square of asbestos-cement from a class 1a or a class 10 building. Removing full glove bag of bounded or non-friable asbestos containing material. You will require class B licence in order to remove non-friable asbestos, and a class A licence for all forms of asbestos removal. All licence holder must notify the Workplace Standards Tasmania 5 days prior to commencing any asbestos removal. A licence can be obtained from the Victorian Government. In a circumstance that a person needs to remove asbestos in an area not exceeding 10 square meters of non-friable asbestos, you are not required to apply for a licence. However the work undertaken by one person should not exceed 1person hour within a period of 7 days. For removal of asbestos containing material that are either bounded or unbounded. For removal of non – friable asbestos in an area that exceeds 10 meter square. A licence holder must notify the licencing body at least 5 days before commencing any asbestos removal work while the less than 10 square meter removal requires at least a 24 hour notification. The Department of Commerce is mandated to issue asbestos removal licence in Western Australia. You are required to have restricted licence in order to remove non-friable asbestos while unrestricted licence is required in order to be in a position to remove all forms of asbestos. It is not a requirement to have a licence when you are removing asbestos containing material in an area that does not exceed 10 square meters. Besides, a licence holder should notify WorkSafe Western Australia as practically as possible before undertaking any work in regards to asbestos removal. You can remove asbestos containing material without having a licence if the area in focus should not exceed 10 square meters. Moreover, the policy only apply for the removal of non-friable asbestos. You can apply for either limited or unlimited asbestos removal licence from NT WorkSafe. The licence is valid for a period of five years from the date of issue. Moreover, a licence holder should notify NT WorkSafe seven days before commencing any removal work. Asbestos containing material do not extend 1 meter in any direction when doing maintenance work. Unlimited licence that allows an individual to remove both friable and non – friable asbestos. However, when the region that you intend to remove asbestos is less than 10 square meters, an individual is not require to have a licence. This entry was posted in News on June 2, 2017 by admin. We, AAHR team welcomed you to our website. If you have any query about our website, you can let us know using our contact us form. We will try to answer you queries soon. Thanks for visiting our AAHR Website. This entry was posted in Uncategorized on January 31, 2017 by admin.